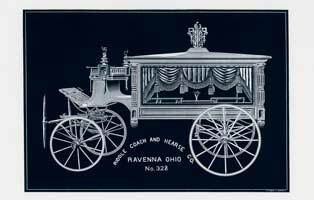 The Riddle Coach and Hearse Company of Ravenna, Ohio has a long history dating back to 1831 when it began as the Clark Carriage Company, owned by N.D. Clark. 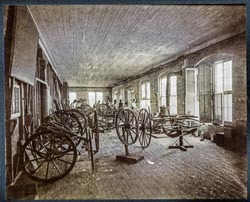 The Clark Carriage Company was bought in 1861 by brothers-in-law, Charles Merts and Henry W. Riddle, my great-grandfather. He was 22 years old. 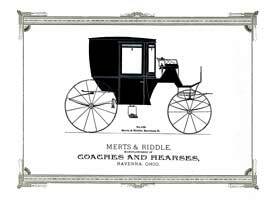 The new name became the Merts and Riddle Coach and Hearse Company. 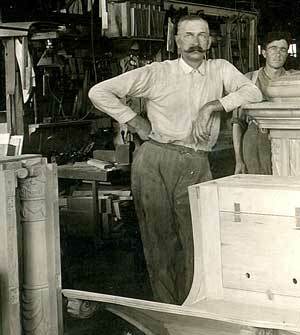 Charles, a fine tool maker and woodworker, supervised the factory while Henry went on the road, selling. He would take a string of vehicles and not return until they were sold. 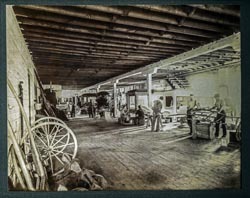 The men upgraded the coaches to a high level and introduced the hearses. 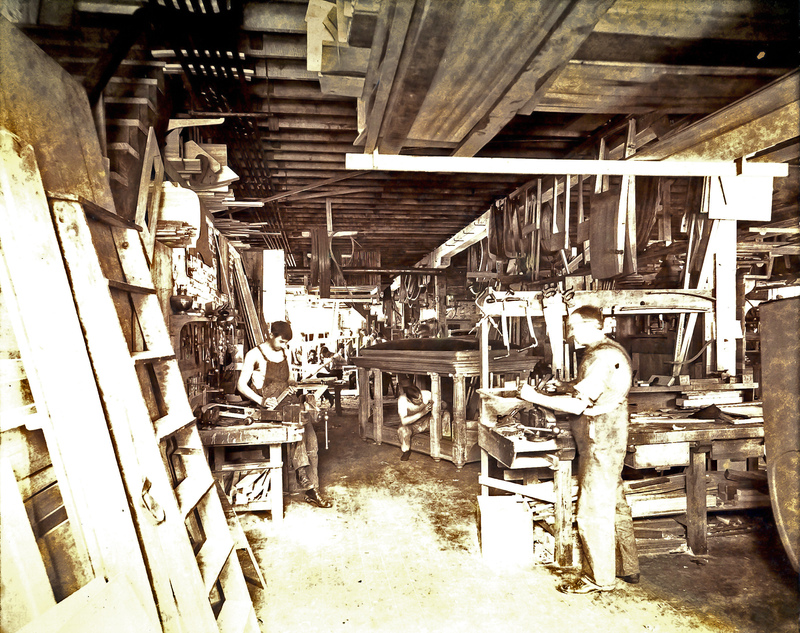 Artisans from around the world were brought in to do fine wood carving and trimming. 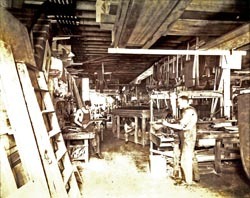 All of the construction was done by hand in the Ravenna factory. In 1891, Merts sold his share of the business to Riddle and again the name changed, this time to Riddle Coach and Hearse. 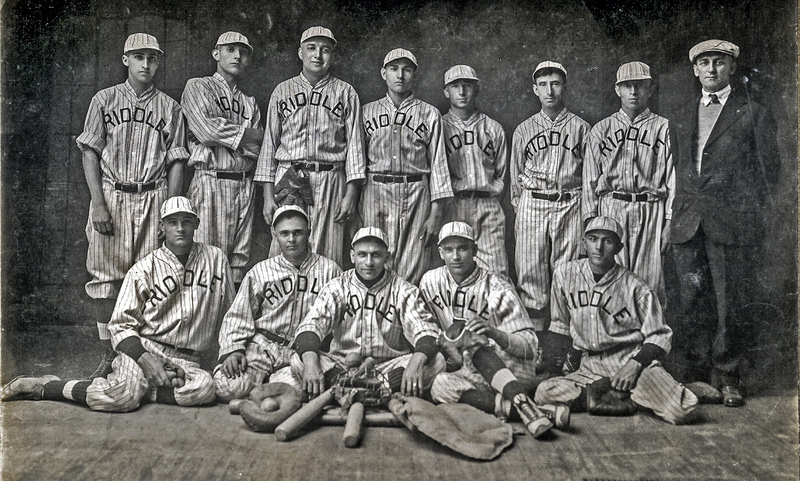 When the company began producing motorized vehicles, the name again changed to Riddle Manufacturing Company. 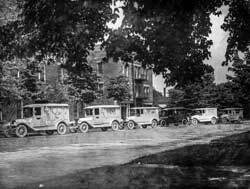 The Riddle hearses became known for their fine quality. 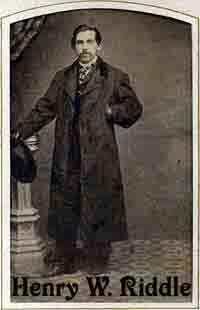 Presidents McKinley and Harding were carried to their graves in Riddle hearses. In 1998 Roy Rogers was buried in a restored Riddle Hearse. 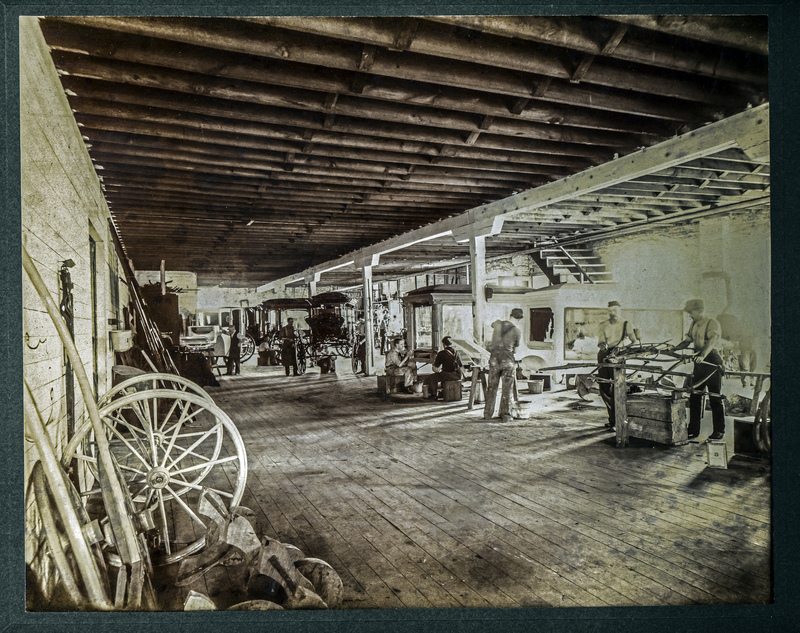 Motorized hearses, including ambulances, were made at the factory beginning about 1911. 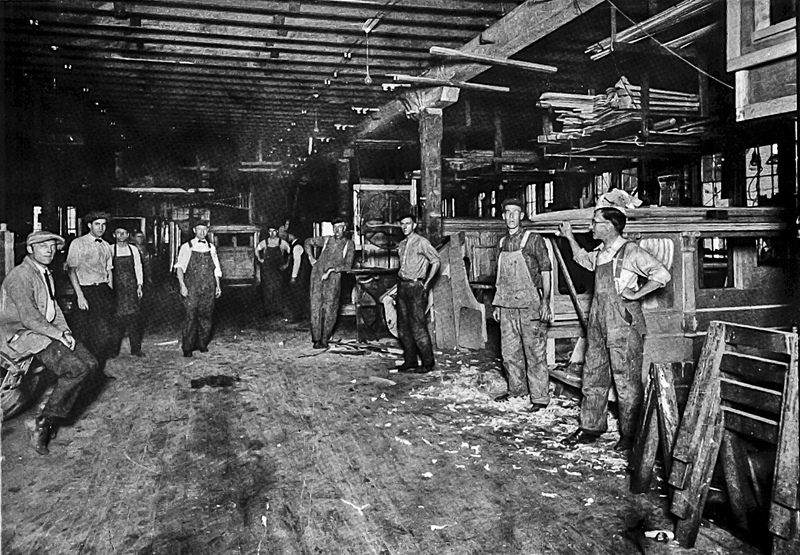 In the mid-1920s the factory needed to change from proudly hand-crafted production to assembly line techniques if it was to keep up with the competition. 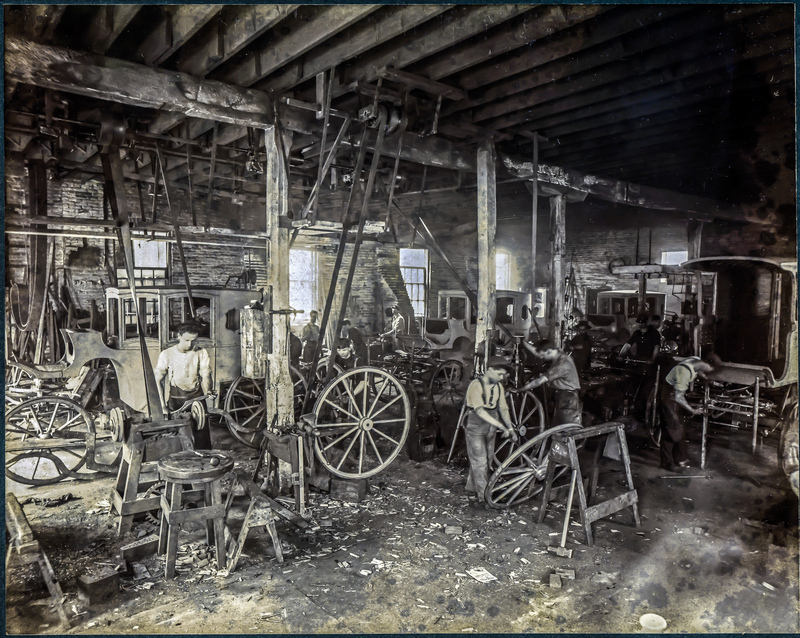 After some family in-fighting, such a major change was deemed too costly and in 1926 the factory closed. 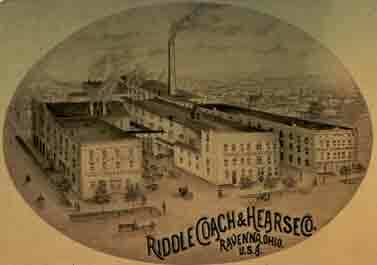 For more in-depth histories of the factory we have two excellent articles for you: The Riddle of Ravenna and Riddle Coach and Hearse Co. 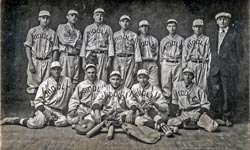 Links to more articles can be found below. We have this in English and Spanish. 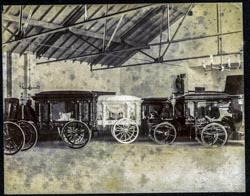 We have a picture of motorized hearses in front of the coach and hearse factory and also a picture of a funeral procession of coaches and hearses. The company had at least some international exposure in that they produced a Spanish language poster to be distributed in Mexico and central America; we have the English version of that poster here. Below are a few pictures of life inside the Riddle Coach and Hearse company as well as some of our favorite advertisements. 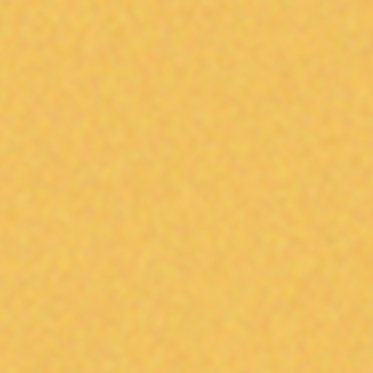 Click any thumbnail to open the full picture. Use your "back" button to return to here. Other pictures of historic Ravenna can be found on my Flickr page. 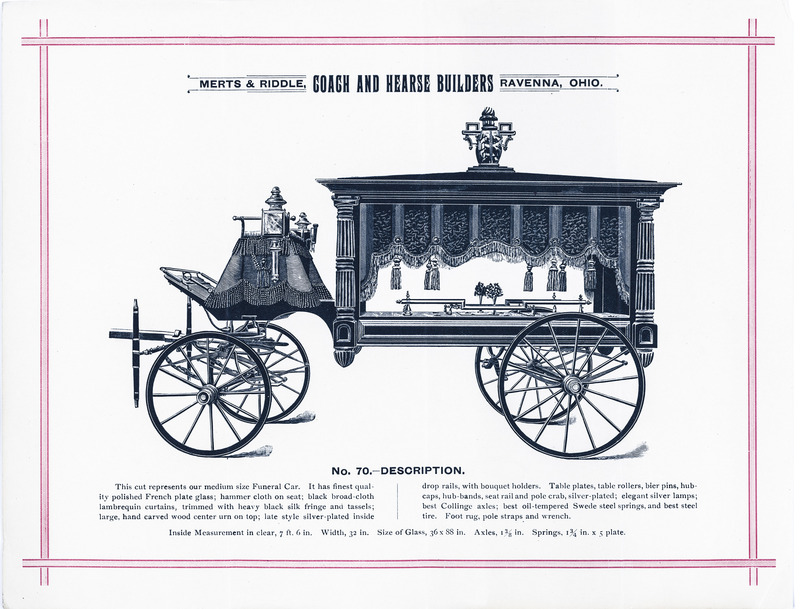 Additionally we have reproduced all of the hearse and coach catalogs that are in our collection. 1905 18-page catalog of hearses "Seventy Four Years of Vehicle Making"
7.5 by 5.25 inches, lavishly produced. 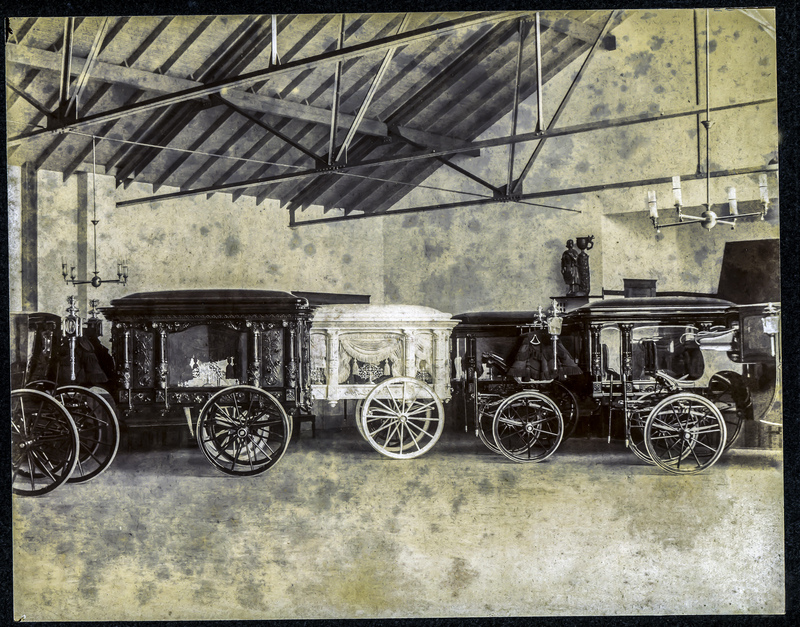 The company produced a Spanish language poster of many of these hearses. 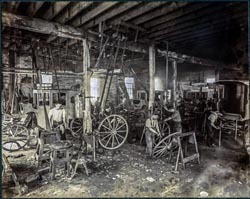 undated catalog that contains motor and horse powered vehicles "Eighty Years of Vehicle Making". 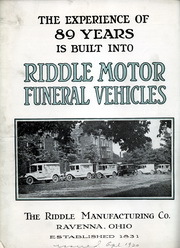 1920 16-page "Riddle Motor Funeral Vehicles" catalog. We also have a poster from the same era. 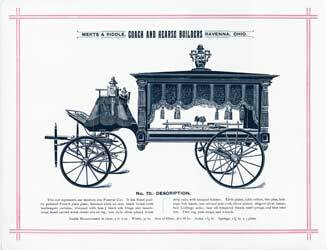 1922 Riddle Motor Funeral Equipment New Series -- Lavishly illustrated, we believe that this is the last catalog that the company produced. 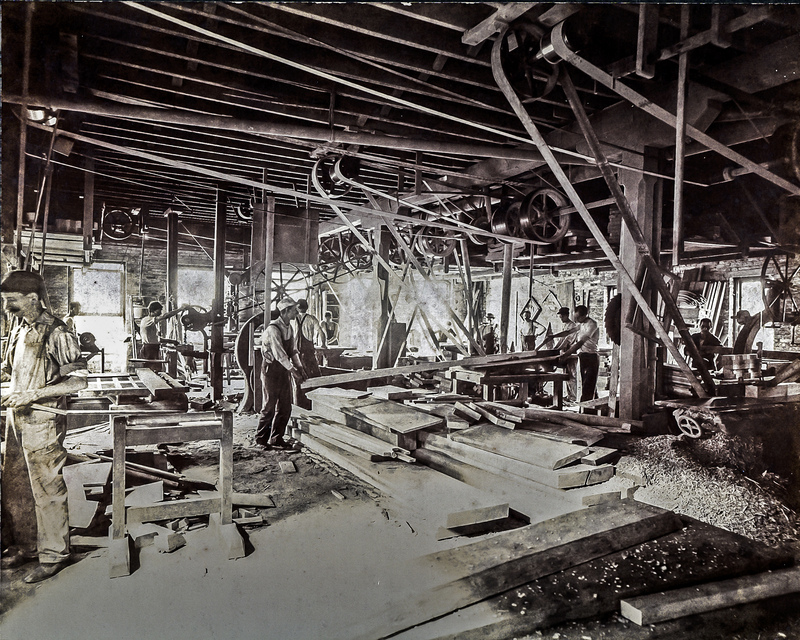 The frames were still made of wood and all carvings continued to be made by hand. We do not know a lot about the day-to-day operations of the business. However, we do have many of the business letters from March 1908. 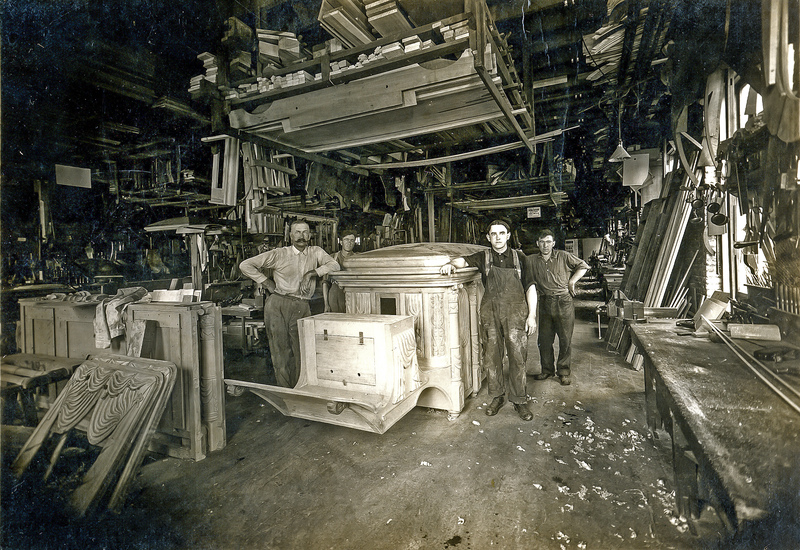 To see recent photos of a 1891 hearse, untouched since stored in 1903, click here. We also have pictures of a recently restored hearse in Oak Harbor, Ohio that is now being used. 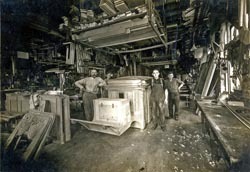 Henry Riddle, who died in 1920, did not trust the banks; that was one reason he spent his money building "The Riddle Blocks" in downtown Ravenna. 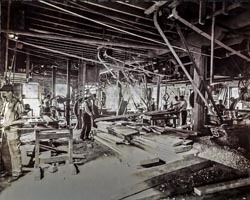 His masterpiece was Riddle Block #1, completed in 1890. 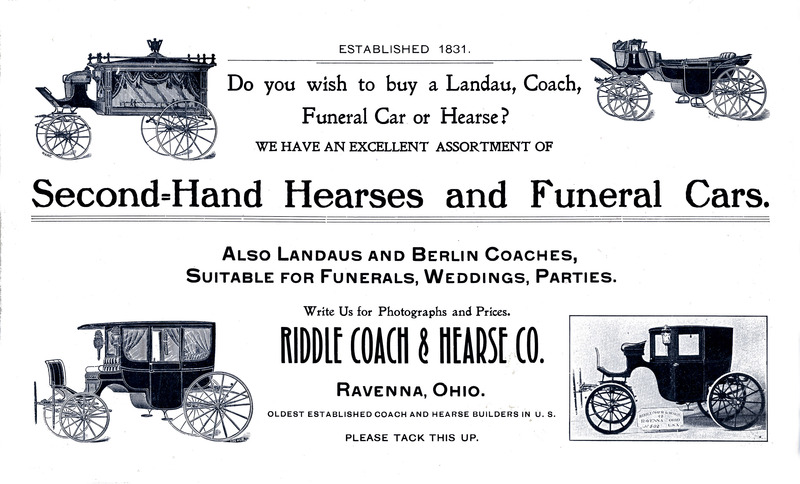 If you come to Ravenna, Ohio , you can find an intact Merts and Riddle Coach and Hearse Company hearse at the Portage Country Historical Society Museum . 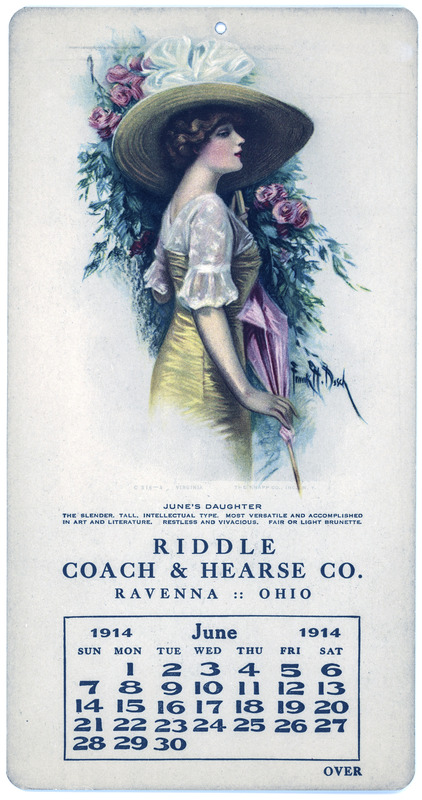 If you visit the Ohio History Connetion in Columbus, Ohio, you can browse the entire Riddle Archive which the Riddle family of Ravenna donated to the Ohio History Connection in 2015. According to the letter sent to us after we made the donation, "The collection can be found in the Ohio History Connection's online collections catalog under the name "MSS 1606 AV Riddle Coach and Hearse Company Collection." 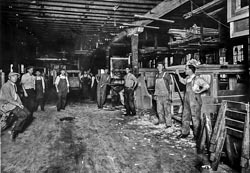 "
Different family members have collected articles about the company, the Riddle family, and life in Ravenna. 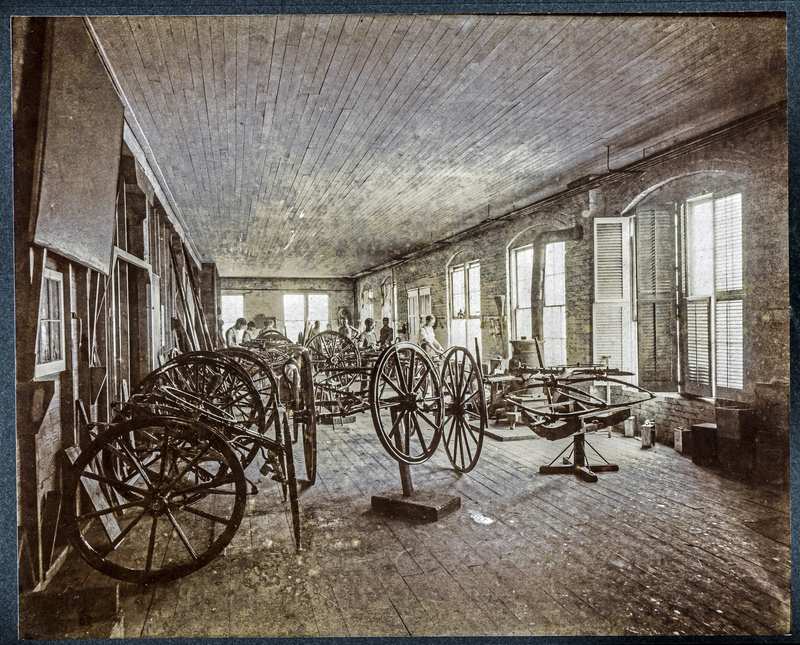 Other people have written detailed histories of the company. We are pleased to present most of the articles in our collection here, which will give readers insight into the coach and hearse industry and Ravenna history. If you have questions, pictures, or stories concerning Riddle Coaches and Hearses, I'd like to hear from you. My e-mail address is thomasriddle at gmail.com .